I just returned from Goshen, Indiana where Madison and I were invited to give the keynote speech for Greencroft Goshen’s 20thAnnual Alzheimer’s Seminar. Afterwards Madison helped me tell how service dogs can help people with Alzheimer’s in the break-out session. This was in conjunction with the “Alzheimer’s: Forgetting Piece by Piece” exhibit which was displayed there. You can see how beautiful the quilts looked in this Fox newscast segment about the exhibit, taped about three minutes after we hung the quilts. Had I known I was going to be on television I would have at least changed clothes. Heck, had I known I was going to be on television I would have been a nervous wreck and probably tossed my cookies! The Maple Leaf Quilters also coordinated an evening just for quilters in the Goshen area and I got to give two presentations. 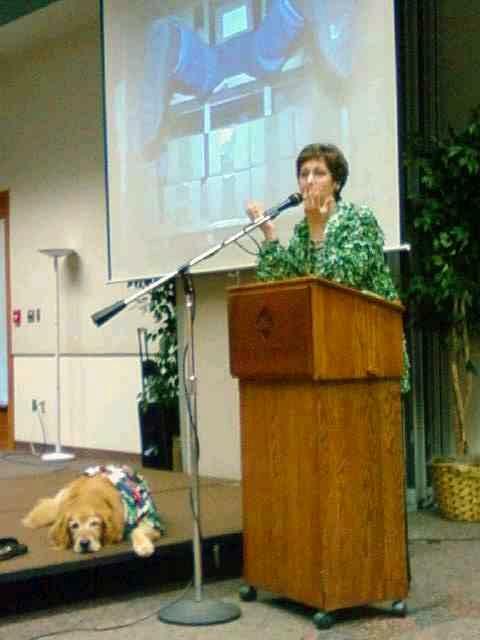 Madison did a great job being a “good dog” while I spoke. He showed off some of his many skills afterwards. 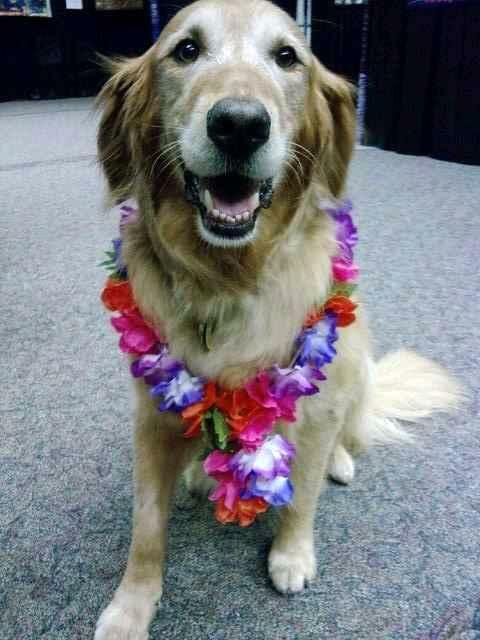 When Madison wasn’t in his service dog backpack “working,” he was in casual attire. (He’s wearing a Hawaiian shirt in the photo above.) He also wore a tuxedo on the day the exhibit opened and a tie-dyed T-shirt on the last day. (I can’t remember what I wore.) His tail wagged so often it will probably be sore for a week! I had way too much fun having him along on the trip. Jennie came in after work on Friday night to help. It’s not often my family gets to see me lecture, so that was fun too. Jennie is responsible for these great pictures. I also got a chance to visit with my friend Ida, who taught me how to quilt more than 30 years ago. It was great fun to catch up with her, two of her daughters, and a granddaughter. No, I’m still not unpacked, and the quilts head out to Lansing, Michigan for the Michigan Quilt Network show at the Lansing Center September 11-14. Dog has to stay home. Entry filed under: AAQI News, Dog Stuff. Tags: AAQI, Alzheimer's, Alzheimer's Art Quilt Initiative, Ami Simms, Madison, service dog. Quilting Aid	Finally! A Way To Use Up Those Stupid Twisted Sisters Leftovers! Ami, you could not have been more articulate and informative in the several seconds that you were on FOX. you did great. What an awesome segment ~ you did great! 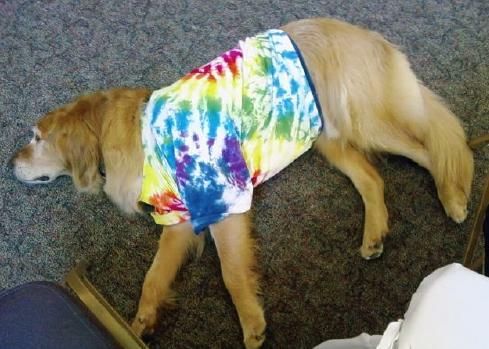 Love the photos of Madison hard at work… love the tie dye shirt! Ami, thank you for everything you are doing… and if you haven’t read Michiele B’s post about her mom, grab some kleenex before you start… yet another example of WHY we’re all with you in this effort! Great job, Ami, but Madison really think that he is a dog!!! I called my husband in to see that your jacket still needs mowing! You did good! Thank you for all the love you put into everything you do, but most especially this cause. The video – and the news presentation!!! – was excellent – you are incredibly eloquent even on what must have been very short notice. I was impressed. You are a natural on TV. It’s amazing how much animals can enhance the lives of those affected with dementia. I worked at a nursing home as a speech-language pathologist my first year out of school, and we had a dog, several cats, and birds in the home. The increases in communication and personal interaction via a loving animal was amazing to watch. I’m thankful for all of the hard work you’ve put into the AAQI, and I’m glad that it’s going so strongly – THANK YOU!